FARMERS MARKET SEASON HAS BEGUN! At least my Mount Vernon market opened today, on the oh-so-happy first day of May. It’s been a long winter folks, and I was so happy to see those familiar farmer faces today. Especially Jesús Ochoa, who I wrote about last year. I planned my meals for the week with a big question mark, predicated on what might be at the market. There were strawberries, Yes! And there was rhubarb, Yes! So you can guess what I’ll make for dessert tonight. I already used some of my asparagus in a farro mix for lunch. Needless to say, I’m pumped about planning meals around my Wednesday and weekend markets. Two days of rain made us all extra primed for a beautiful first day at the market. I was so enthralled, I nearly missed the exercise class I was teaching, lollygagging around, feeling the need to welcome the new vendors. And there were some exciting additions: a milk, ice cream and (soon) cheese curds vendor, a couple selling gorgeous tulips and manlys and lilacs galore (perfect for Mother’s Day!) and a new vegetable vendor whose baby Pac Choy (like Bok Choy) was irresistible. It will be accompanying pistachio-and-pomegranate meatballs (from the new Washington Post Cookbook!) tonight. I couldn’t help but think, as I met new vendors and caught up with old ones, about a wonderful book I just read to write a review about. 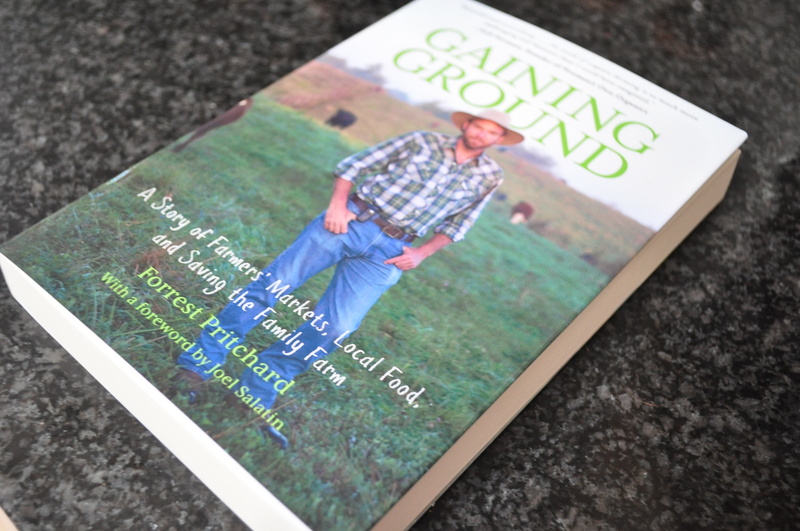 In his book, Gaining Ground: A Story of Farmers’ Markets, Local Food, and Saving the Family Farm, Berryville farmer Forrest Pritchard depicts his journey to save the family farm, largely from the commodity markets to which it was enslaved (earning $18 for five freight cars of corn). He talks a lot about the farmer’s perspective at the market, how new and scary it is to watch customers walk by, contemplating whether your goods are worth buying, whether your stand is even worth entering, while you try not to stare. They give these excuses (why do we feel the need to do that?) for not buying something after they’ve engrossed the farmer in a long conversation about why his grass-fed meat products are superior. As Joel Salatin wrote in the foreword, the book reads like somewhat of an adventure novel to those of us who only dream about farming, longing to make a connection with the people who actually do it each time we go to a farmers market. Well, if you’re looking for a way to connect between markets — and to understand all that goes into them getting there, I’d recommend Forrest’s book. It’s from the perspective of a farmer who blazed the trails, especially for pasture-raised meat and eggs, for our region just as farmers markets were taking off more than a decade ago. I read it online and found it serendipitous that my pre-ordered hardcopy was waiting on my porch when I got home from the market. You can order the book here. Enjoy this beautiful spring weather and the produce that comes with it! pistachio and pomegranate meatballs with baby pac choy? Are you kidding? I’m coming over.